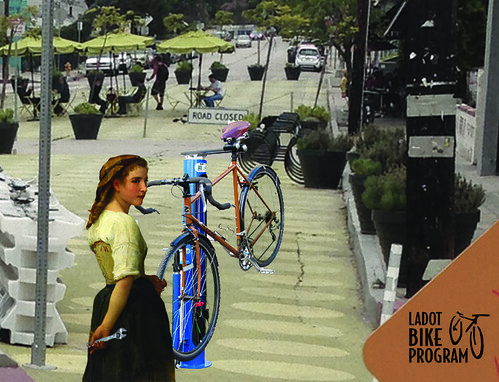 Great news bicycle repair enthusiasts, we are even closer to implementing our pilot run of Bicycle Repair Stations! City Council has adopted and approved the motion to accept the $17,000 grant from the Bikes Belong Foundation we applied for last year, thereby making funds available for the Bicycle Repair Station Business Improvement Program. As discussed last year on the bike blog this program will see the implementation of 7-10 pilot Bicycle Repair Stations across the city. 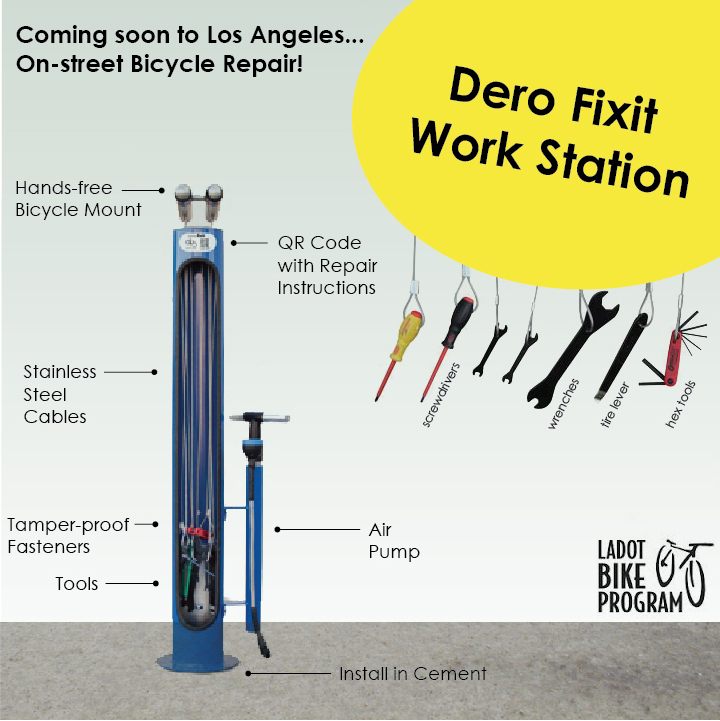 The product we will be using – Dero’s Fixit Bike Repair Station is equipped with a tool kit and air pump. The Repair Station comes with detailed instructions for a wide variety of bicycle repairs that are just a smart phone scan away. One of the greatest concerns we heard from the last blog post was security. We will be working with the manufacturer to make the toolkit as vandal proof as possible. We also hope that by placing the stations in highly visible spaces in front of businesses that will care for them as a maintenance partner, we will deter theft with eyes on the street. 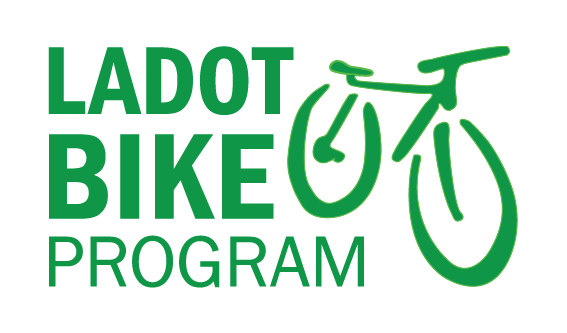 By placing these stations near our bicycle corrals and bicycle friendly businesses, this program will create a Bicycle Friendly environment that will contribute to and enhance the larger community. We are still looking for locations for these stations. Requirements include a maintenance agreement similar to the Bike Corrals and the location criteria outlined in the last post. If you are the owner of a local business who would be interested in having a Bicycle Repair Station outside your establishment, please fill out this form and we will be in contact with you shortly. Dero Fixit Work Stations coming soon to a neighborhood near you! When shall we have car repair stations with free tools for all? There are far more cars being driven than bicycles being ridden on a regular basis. Atwater Village, and/or Glendale Narrows LA River bike path. Maybe at the new park next to the bike path. We’d love one! Smart phones required? How many will not be covered? Any chance of putting these around train stations? It would be handy to have one near Memorial Park and Allen on the Gold Line. Which cities currently use these devices? Have we studied their success/troubles with them? The air pump is a good idea but I’m thinking those tools are going to vanish in a week. I’d be happy with a decent bike stand for flat repair and shifting adjustment. A little off topic but it would be great to have a quiet through street indication. Maybe just an arrow on the ground. Nothing big. Just a way to know about/find streets that run a good way continuously that are way more residential than the usual bike routes. Its much more pleasant than riding with buses and a million cars. Thanks. Metro stations would seem to be a natural place for these. Really…within a week they will all be gone. Great idea in a perfect world, but.